Good Gravy Man, Pull Yourself Together! 1st serving guy puts roast beef on my plate. Cool. I hand my plate to the 2nd serving guy. 2nd serving guy puts corn on my plate. Two for two. Awesome. Me:”And some gravy on the beef, please”. 2nd serving guy starts to scoop up some Brussels sprouts. 2nd serving guy looks at me and starts to scoop up Brussels sprouts again. Me (pointing at the gravy):”No, just some gravy on the beef, please”. Me:”Yes, some gravy on the beef please”. 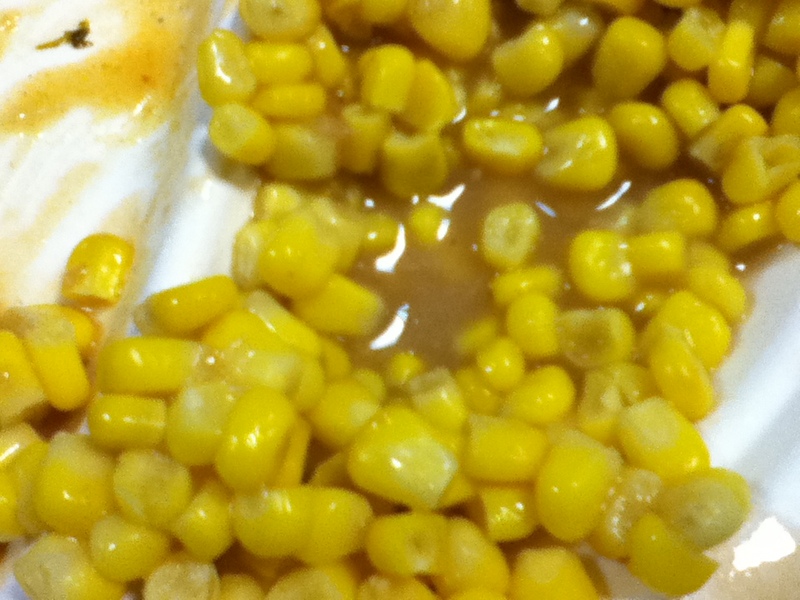 2nd serving guy proceeds to dump gravy onto my corn. This entry was posted in Luxembourg and tagged corn, DFAC, gravy, kandahar, luxembourg by Kafoodie. Bookmark the permalink. Next time you should try the simplified English/colors technique. Example: ”Roast beef, please”. S/B ”Brown stuff, please”. “Corn please”. S/B “Yellow stuff, please”. It works for me. Good luck.